You Found Me consists of 9 songs (36 min, 16 sec). This is one of those releases that's hard to categorise - which always makes albums a joy to listen to. There's a little rock, a little indie and a tip of the hat towards folk. I totally loved the guitar part in the opener, 'I'll Never Leave U'. It's simple and a little repetitive, but it's used sparingly and really helps to elevate a good solid song into something much more engaging. 'This is Alone' is a song that instantly sounds familiar. Votolato's vocals sound raw and vulnerable and there's an almost nervous, timid feel to the performance - which, oddly enough, gives it its strength. 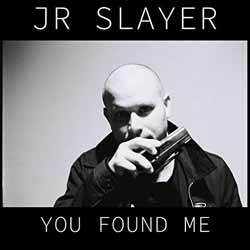 'In A Sea of Anonymity' is about as close to folk as JR Slayer strays. It's a good solid track with a catchy main theme. It's certainly an LP that takes a while to get your head around, but if you invest the time in it you'll reap the rewards.